Private William Gordon Dickson’s image found in a file of newspaper clippings held at the Royal Scots Museum, Edinburgh. 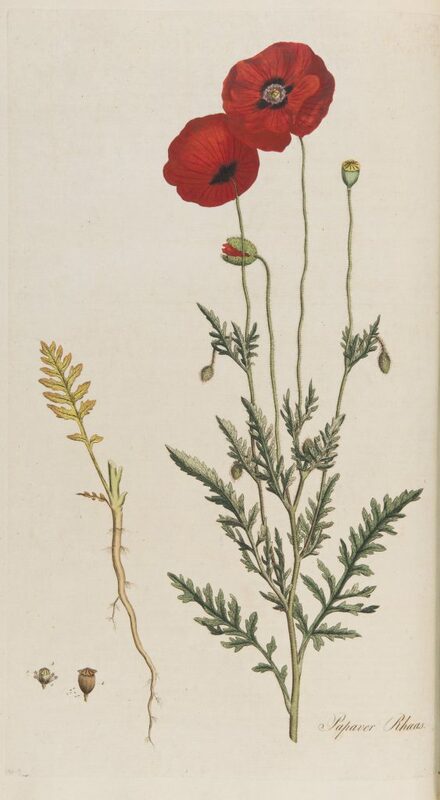 William G. Dickson joined the staff of the Royal Botanic Garden Edinburgh as a Labourer on the 3rd August 1914, the day before Great Britain declared War on Germany. Prior to this he had been educated at Daniel Stewart’s College and had worked at the Albert Hall and Operetta Picture House on Shandwick Place – it was one of Edinburgh’s cinemas before the War. On the 4th September 1914 after a month at RBGE, Dickson enlisted as a Private in the 5th Battalion of the Royal Scots. After a period of training, Dickson was sent with the Royal Scots to Gallipoli, landing there on the 25th April 1915 as part of the 88th Brigade of the 29th Division. He was there for just over two months and would have taken part in a number of offensives against the Ottomans, namely the three Battles of Krithia. By the end of June the 5th Royal Scots had made limited progress along the Gallipoli Peninsula and both the Allied and Ottoman forces had established a system of trenches. The commanders decided upon a different strategy now. Rather than attempt to make great advances along the Peninsula – something that hadn’t worked so far – try instead to take the nearest trenches and make slow but sure progress. The French achieved reasonable success with this objective on the 21st June, and a week later it was the turn of the British and Indian troops to try the same along the Gully Ravine to the northwest of Krithia. The job of the 5th Royal Scots in this endeavour was to move backwards, allow another Brigade through to lead the attack and then move up to the front line and hold it. If the attacking Brigade was unable to achieve its objectives in any way, the 5th Royal Scots and their Brigade were to take over. The Battle of Gully Ravine was reasonably successful in achieving its aims, securing a number of Turkish trenches, but there were some that proved impossible to take. The 5th Royal Scots went over the top on Fir Tree Ridge late in the afternoon of the 28th June to bolster the attempt to take two of these, but it wasn’t possible. 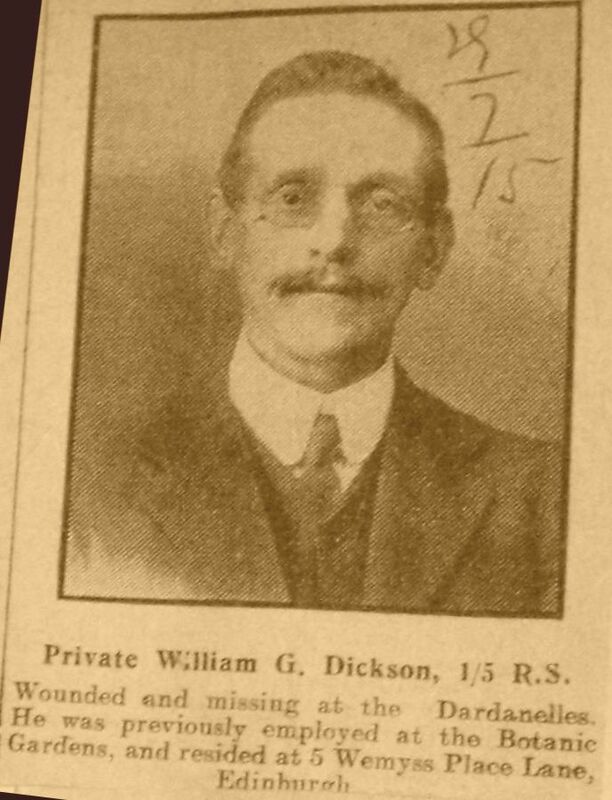 Private William G. Dickson was to lose his life that day, it being reported in The Scotsman that he was wounded and missing. Dickson is one of many that has no grave and is remembered on the Helles Memorial in Turkey and on the Great War Memorial at RBGE. With thanks to Garry Ketchen for allowing me to use his invaluable genealogical research, to the staff at the Royal Scots Museum, Edinburgh Castle, for help wih research and permission to use the images found, and to Stephen Chambers for his book ‘Gully Ravine: Gallipoli’, 2003, without which it would have been remarkably difficult to research this battle. Thank you for posting this notice on my grandfather and including the photograph since I had never seen one of him.